The ELCA is already working here in the Central African Republic to combat malaria. Two rural clinics and a village health program provide malaria education and treatment. The story of little Agrippa (named after King Agrippa in the New Testament book of Acts) is typical. At fourteen months, Agrippa had already suffered numerous bouts of malaria. After several illnesses, many people develop partial immunity to malaria, but the parasite remains in their blood, where it continues to destroy red blood cells. Without enough red blood cells to transport oxygen throughout the body, the victims often die – especially infants and small children, who are more susceptible than adults. In Agrippa's case, the malaria parasite had destroyed over half of his red blood cells and left him vulnerable to possibly fatal anemia. Fortunately, his mother took him to the Emmanuel Health Center, a project of the Evangelical Lutheran Church of the CAR, with sponsorship from the ELCA, Global Health Ministries, Lutheran Partners in Global Mission and other donors. There Agrippa received a life-saving blood transfusion, and treatment to kill the remaining parasites in his blood. Many children here in CAR aren't as lucky. They live in small villages with no medical facilities, and no one to take their photos or to hear their stories. I happen to know about Agrippa because his father and mother are my students at the Lutheran seminary here in Baboua. In a country where thousands of babies and children die needlessly every year, it's nice to know of one baby who will live. 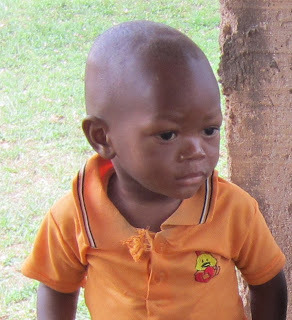 Please consider helping with the ELCA Malaria Campaign. Thanks. Joe and Deborah are ELCA (Evangelical Lutheran Church in America) missionaries in Baboua, the Central African Republic. Pastor Deborah teaches at the Theological School in Baboua. Joe serves as technical advisor for PASE, which provides safe drinking water and promotes good hygiene and sanitation to villagers. Their daughter, Christa, attends ninth grade at Rain Forest International School in Yaoundé, Cameroon. usually , most cases of malaria happens in Africa. . . I don't know where the mosquito carrying malaria lives.